Jack Taylor/Getty ImagesInternational Trade Secretary Liam Fox. Britain will reportedly have just a few weeks to roll over more than 40 free trade deals. Liam Fox’s trade department must renegotiate the deals Britain has an EU member state so they continue after Brexit. However, the department will have just a few weeks between December 2018 and March 2019 to do this. The CBI has previously warned that failure to roll over trade deals could bankrupt businesses and destroy jobs. LONDON – British negotiators are set to have just a few weeks to renegotiate over 40 trade deals it currently has with other countries, as part of its membership of the European Union, before it leaves the bloc in March 2019. One of the biggest tasks facing the UK government is to ensure the free trade deals it already has with other non-EU countries continue to apply after it has departed. EU officials have told Theresa May that the UK’s Department for International Trade will not be able to begin renegotiating these trade deals until the Withdrawal Agreement has been signed off at the end of this year. 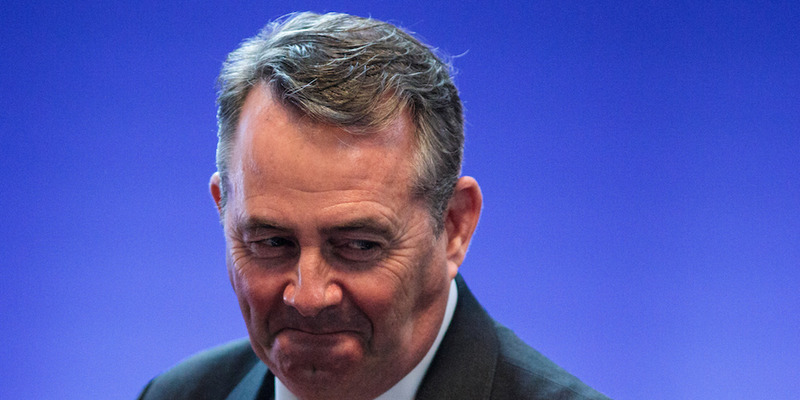 This would leave Liam Fox’s trade department with just weeks between December 2018 and March 2019 to renegotiate over 40 trade deals with numerous countries, which account for around 15% of Britain’s imports and exports. The EU will not let Britain begin looking at post-Brexit trade deals until all issues all of its withdrawal have been resolved. This includes the Irish border dilemma, which has held up negotiations for weeks. On Sunday, Germany’s Brexit coordinator said “not many” people were expecting talks to progress significantly at the next European Council summit this month, and warned it was “unclear” whether there’d be a final deal. In April, the CBI – Britain’s biggest business group – told Business Insider it had “serious doubts” that Britain would be able to roll over tens of trade deals in time for Brexit, and warned that failure to do so would bankrupt companies. “The UK fundamentally lacks the experience or the bandwidth to conduct 20 or more trade renegotiations in parallel to complete before the potential cliff edge of January 2021,” the CBI’s chief trade spokesperson, James Ashton-Bell, told BI. The CBI added that May’s government “cannot reasonably expect that replications of agreements will be free from prolonged renegotiations,” citing a number of concessions third countries have made to the EU which “they will no longer be willing to give the UK on its own,” plus deals which countries have expressed a desire to modernise. He cited countries like Norway and Switzerland, where trade terms are not written down in a single agreement, and therefore cannot be replicated in any case without a completely new deal being struck. The CBI’s intervention followed a BI report, which revealed the European Commission had warned other EU institutions that it was “deeply concerned” about the UK’s lack of preparation for carrying over trade deals after Brexit. The Commission also cited Fox’s “failure to grasp basic concepts and trade-offs” relating to the rollover process. Numerous figures from across British business have told BI that “large swathes” of Fox’s trade department are “reluctant to accept the help of outsiders” when it comes to preparing for Brexit.